Customization with 3D printing goes beyond personalized objects, implants, and clothing to include almost any design for an object or device. Many times, issues are only discovered after a design is already in use, which can prove very troubling when the manufacturing facility is unavailable and far away. Ships in the U.S. Navy operate for extended periods of time far away from land, and sometimes need parts or modifications that aren’t readily available. Some ships have started employing on-board additive manufacturing systems to assist in the prototyping of modifications and to do direct digital fabrication of components to be deployed operationally. Eventually, improvements to additive manufacturing will allow in-place repairs to equipment that is currently inaccessible without major work at a service yard. Metal cladding can use this process to add material to an existing metal object, allowing the repair of damaged mechanical equipment. Submarines may yet be equipped with specialized 3D printers that crawl along the spaces between the inner and outer hulls, providing mid-operational repairs that are currently impossible. Similar needs have been found for smaller equipment as well, leading the U.S. Army to create the Mobile Expeditionary Lab, a 20-foot shipping container packed with rapid-fabrication systems that can be used by soldiers in the field without access to parts shops and metalworks in conflicted areas. Early successes of this capability include creating new brackets to adapt equipment to fit on local vehicles, or a small cover that prevents a soldier’s flashlight from being accidentally turned on while moving around during maneuvers. Bringing this capability to the location can best identify needs and test designs that fit the locale (a desert, say, as opposed to a jungle). Presently the Army can get a new product, component, or update into use within days. Designs at the lab are uploaded to the Rapid Equipping Force’s home location where they can be reviewed, updated, or sent for full scale fabrication with a tremendously shortened chain between the troops and their gear. Few environments provide a greater challenge than in space travel. If the only wrench that fits the radio mast gets lost during repairs, it’s exceptionally difficult to have a replacement delivered. 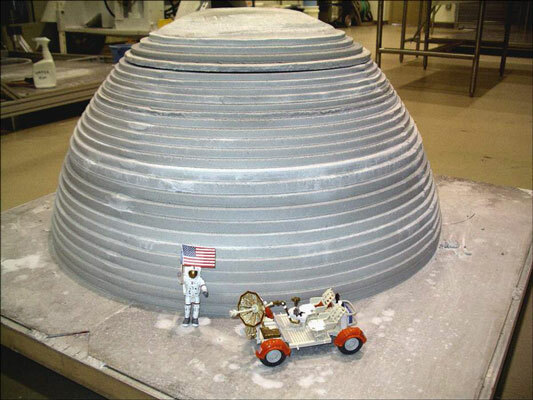 No wonder additive manufacturing is under deep investigation by NASA and other spaceflight services. Being able to make what astronauts need in flight and en route is potentially a vital feature of future spacecraft. The cost of lifting anything from the surface of Earth is still (pardon the expression) astronomical. When planning a mission to another planetary body, the use of native materials like lunar soil (called regolith) and energy from the sun is very appealing. 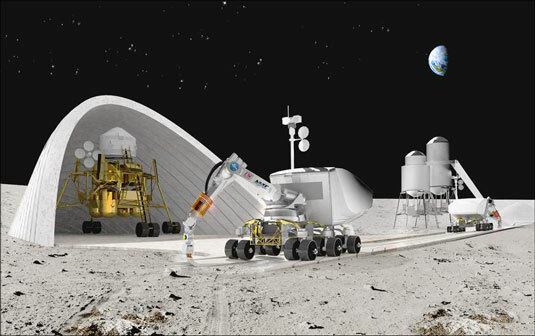 If the same systems used with sand and dirt here on earth can be adapted so that they can be used on the moon, robotic systems can be sent ahead to print out roads and structures to house our astronauts without further cost for lifting materials to orbit and to the escape velocity beyond that.